This article first appeared 3 years ago, but little has changed since. The Langenbruck Solar Bob must be one of the best ways to spend your leisure time ever invented. 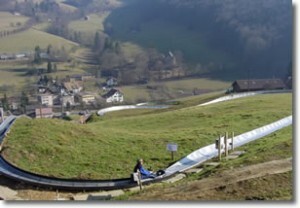 Located in the far reaches of Baselland, near to the border with Solothurn, this summer bobsleigh ride puts you in control and is just so much fun. Nestled on the side of a steep Jura hillside where the land contours support a 1,000 m long stainless steel track that bends and twists through alpine meadows on its way down to the valley floor, the Langenbruck Solar Bob is something you really shouldn’t miss. It’s a real experience for young and old, timid and brave, male and female. After buying your tickets (the more goes you pay for, the cheaper the per ride cost, and trust me, you will use the extra ones!) you enter the track area via a turnstile and are shown your sled. If its your first visit full instructions are given in English, and they also have an instruction sheet in English if you prefer to read what to do. The sleds themselves are well made and maintained, although some of them do seem faster than others. One or two people can sit on a sled, although two would make for a tight fit. You have a small backrest, a footrest, and a brakelever in between your legs. Pull it back to brake, push it forwards to release the brakes and accelerate downhill. First of all you need to get to the top of the hill. Don’t worry, a solar powered steel cable runs all the way up the hill to pull you and your sled to the top from where gravity takes over. You just sit in the sled and keep the brake on until you reach the top. Then push the lever forwards and away you go. To begin with the acceleration is gentle, then there’s a a sudden dip and speed picks up before the first gentle corner increases your excitement level. From then onwards the corners get faster and faster as the effect of gravity translates into increasing speed. You really get to imagine what it must be like in a real winter sports bobsleigh. And all the time you are in control of the speed with the very effective brake lever that doubles up as a handle. Towards the bottom you swiftly run under a small bridge, and with the rushing grass on each side of you, inches away from your eyes, the sensation of speed is really quite phenomenal. After the bridge a speedtrap records your speed in kilometres per hour and displays it for you (and the runner immediately behind you) to clearly see. Sadly there is no paper printout to have as a souvenir but my eldest 11 year old daughter recorded a speed of more than 52 kmh, and the younger 9 year old just over 50 kmh. My older, fairly heavy frame could only manage 48 kmh, but I blame the sleds I got – naturally! Safety seems pretty good, it is certainly possible to go down the whole track in the dry without using the brake lever once and without coming out of the track which seems incredibly well designed and engineered – typically Swiss – but you do have to lean into each corner just like on a real Bob or you could come out. Just after the speed trap a 540 degree spiral slows you down quite a bit before you come out onto the finishing straight where you are warned to brake hard. 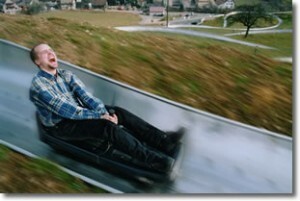 If you don’t there are some strategically placed nylon strips hanging down that slap your face if you are going too quickly – a pretty effective way to stop young idiots going into the back of you as you get off the sled. The facility is really well laid out and professionally run. The car park has some sturdy picnic tables made out of tree logs at one end, right next to the 540 degree corner so you can sit and admire the revellers as they fly past with grins as big as catfish all across their faces. Just behind the ticket kiosk is a small restaurant with good outside seating areas for parents to enjoy a coffee while the kids get on with the serious stuff. Unfortunately there seem to be no souvenirs available, so no T-shirts, caps or postcards to buy. It would be nice to get a printout of your speed, particularly if this was linked to a digital photograph of you on the sled with the speed printed above your head. But then, it does cost next to nothing each go, and it is really just so much better value than any fairground ride: it feels somehow more real, lasts longer, and you’re more in control. It also costs less! We liked it so much the first time we had to go the next day as well, it really was so much fun. I recommend it highly. Have a go – you won’t be disappointed! The Solar Bob runs daily from 13.00 hrs to at least 17.00 hrs in summer and until 16.00 hrs in winter, but do check their website (www.solarbob.ch) for up to date details. They also do corporate events. Each ride takes about 7 minutes to complete, including getting on and off the sled and waiting for the green light to send you on your way. The descent of course is a lot quicker! Langenbruck is located near to the A1/A2 motorway junction in the Jura hills not far from Liestal. By road, follow the valley from Liestal towards Waldenburg and then keep going to the top of the hill. You’ll pass some wonderful scenery on the way. When you have crested the hill, travel through Langenbruck village itself along Hauptstrase and you will soon see the Solar Bob on your right as you leave the village in a southward direction. It takes about 45 minutes to drive from Basel.